Profit maximization means maximizing the money (or any other currency such as dollar, pound or bath) income of firms. Firms produce goods and services. They may function in a market economy, or in a government-controlled economy. In a market economy, price of goods and services are determined in competitive markets. Firms in a market economy are expected to produce goods and services desired by society as efficiently as possible. Price system is the most important organ of a market economy indicating what goods and services society wants. Goods and services in great demand command higher prices. This results in higher profit for firms; more of such goods and services are produced. Higher profit opportunities attract other firms to produce such goods and services. Ultimately, with intensifying competition an equilibrium price is reached at which demand and supply match. In the case of goods and services which are not required by society, their prices and profits fall. Such goods and services are dropped out by producers in favor of more profitable opportunities. Price system directs managerial efforts towards more profitable goods or services. Prices are determined by the demand and supply conditions as well as the competitive forces, and they guide the allocation of resources for various productive activities. A legitimate question may be raised: Would the price system in a free market economy serve the interests of the society?. The answer has been given by Adam Smith many years ago. According to him, (The business), by directing… industry in such a manner as its produce may be of greater value… intends only his own gain, and he is in this, as in many other cases, led by an invisible hand to promote and end which was not part of his intention.. pursuing his own interest he frequently promotes that of society more effectually than he really intends to promote it. It is thus generally held by the economists following Smith’ logic that under the condition of free competition, businessmen pursuing their own self-interest also serve the interest of society. It is also assumed that when individual firms pursue the interest of maximizing profits, society’s resources are efficiently utilized. 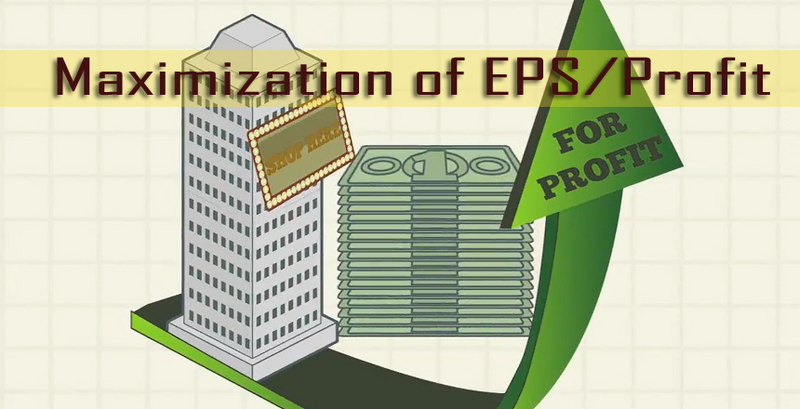 In the economic theory, the behavior of a firm is analyzed in terms of profit maximization. While maximizing profit, a firm either produces maximum output for a given amount of output or use minimum input for producing a given output. Thus, the underlying logic of profit maximization is efficiency. It is assumed to cause the efficient allocation of resources under the competitive market conditions, and profit is considered as the most appropriate measure of a firm’s performance. The profit maximization objective has, however, been criticized in recent years. It is argued that profit maximization assumes perfect competition, and in the face of imperfect modern markets, it cannot be legitimate objective of the firm. It is also argued that profit maximization, as a business objective, developed in the early 19th century when the characteristics features of the business structure were self-financing, private property and single entrepreneurship. The only aim of the single owner then was, to enhance his or her individual wealth and personal power, which could easily be satisfied by the profit maximization objective. The modern business environment is characterized by limited and a divorce between management and ownership. The business firm today is financed by shareholder and lenders but it is controlled and directed by professional management. The other interested parties are customers, employees, government and society. In practice, the objectives of these constituents (or stakeholders) of a firm differ and may conflict with each other. The manager of the firm has the difficult task of reconciling and balancing these conflicting objectives. In the new business environment, profit maximization is regarded as unrealistic, difficult, inappropriate and immoral. It is also feared that profit maximization behavior in a market economy may tend to produce goods and services that are wasteful and unnecessary from the society’s point of view. Also, it might lead to inequality of income and wealth. It is for this reason that governments tend to intervene in business. The price system and therefore, the profit maximization principle may not work due to imperfections in practice. Oligopolies are quite common phenomena of modern economies. Firms producing same goods and services differ substantially in terms of technology, costs and capital, In view of such conditions, it is difficult to have a truly competitive price system and thus, it is doubtful if the profit-maximizing behavior will lead the optimum social welfare.